Get in Top 10 or die! When you go to the Big Fish Games website don’t you feel depressed? Almost every game there is a hidden-object game… at least that’s the first impression. But I bet you’ll be surprised when I tell you that hidden-object games state only 35% of top 100 games. 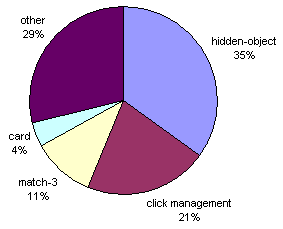 Still, it is the largest group. Here’s a full break down of top 100 games on Big Fish Games. I put all action, strategy, RPG and other games that doesn’t fit into 4 major categories categories. There are also two interesting colums on the list: peak and weeks in. 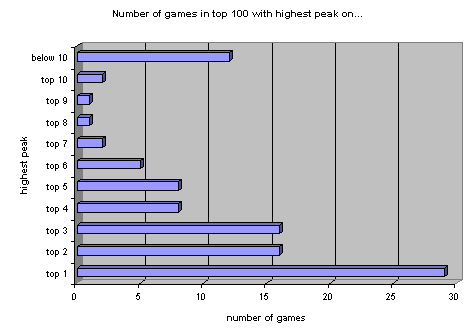 I was very curious what is the lowest peak for a game to get into top 100. If you are aiming to make an average game you better give up before you become disappointed… or change your thinking and aim higher. Unfortunately not. It is 7.26! What???? Yeah, we need to dig deeper. So do you want to know how many games are on the list that have not been in top 10? Guess again. What’s your number? 61 out of 100 games in top 100 reached at least 3rd place. 77 out of 100 games reached at least 5th place. 88 out of 100 reached at least 10th place. But if you haven’t gave up yet, keep in mind, that even if you’re small team, you can still make it. Just focus on the right thing. Make gameplay your priority. Production values are not so important – it’s not retail. I don’t really agree with this. You are right, it is not as important as retail but you can’t really get away with programmer’s art. To reach the top 10, you still need very good art. Well, I never said you can get away with programmers art, though Alice Greenfingers proofs that playability is more important than great art. Also, finding out the average position was 7.26 was very interesting! Fairway reached no.3 and is currently in the 60s somewhere 4+ months after launch. If you mean Large File Adventure Games then those have separate category at BFG and I put them into others. In other cases I assigned same categories as BFG did.